The surrounding beauty makes Sonoma Valley tourist attractions some of our favorites in the state. It’s no wonder the area earned the nickname “Slow-noma” as it invites you to breathe in – deeply – and just enjoy the good life. Then again, should you have “a need for speed,” there’s always the Infineon Raceway to get you going! The Sonoma Valley is a bit more laid-back than its Napa Valley neighbor to the east, and that difference is also apparent in the list below. While there are certainly places to shop, a good number of the things to do in Sonoma Valley revolve around just being outdoors – whether you sit on the historic plaza to eat some cheese and drink some wine (it’s legal) or just walk around an area garden or park. What sounds good to you? Did you find any Sonoma Valley tourist attractions that interest you? There are a lot of things to do in Wine Country, and this California Wine Country map will help you find them. You may also want to check out our Napa Valley tourist attractions and Western and Sonoma Coast tourist attractions articles for some additional ideas. 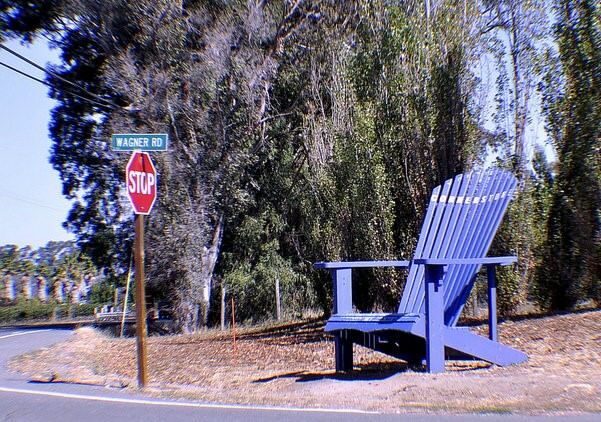 Photo of Big Blue Chair at Cornerstone Gardens in Sonoma by Edward Kimmel via flickr (Creative Commons).